Things are starting to explode. Snow peas are coming (but maybe just a little), cabbage returns, cucumbers are here in greater quantity, and fennel makes its season debut. Lions Mane mushrooms are on the shelves this week. This week, instead of cooking anything picturesque, we drove to Pittsburgh, ate strawberries and asparagus, and played with a baby. It had been a few weeks since we last saw the baby (my sister’s, if you’re just tuning in! ), which of course is a looong time in the life of a newborn. She’s gone from a three-week-old constant sleeper to a nine-week-old sleeper/screamer/smiler/snuggler. She likes funny faces and being jiggled, and Dusty, it turns out, is a really good baby jiggler. It was a wonderful couple of days, but leaves me without any good food pictures. 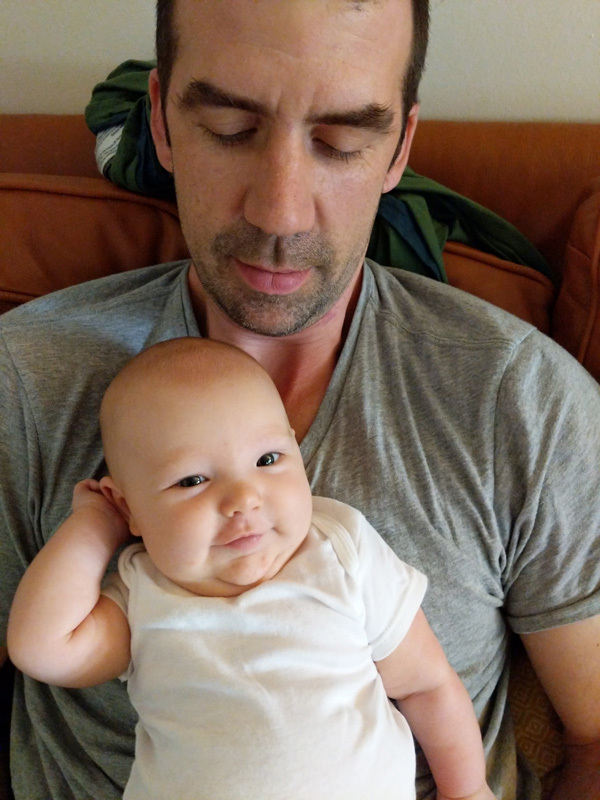 A cute baby is almost as good, though, right? On the good food front, I am a little overwhelmed this week with the number of new options coming in, and am having the teensiest bit of trouble thinking about what I want to make first with all these seasonal goodies! The cucumbers we had last week were fantastic, albeit in small quantity, so now that there’s more of them I’m excited about some kind of cucumber salad, or maybe just eating one with salt. I’m still into eating as many strawberries as I can get my hands on, preferably with heavy cream — so that’s breakfast and dessert. Cucumber with maybe a little mayo, or a homemade blue cheese dressing or some feta on the side might be lunch? And maybe for dinner something like this grilled chicken with bok choy and radishes (maybe adapted for full-size bok choy & no bell pepper yet)? Or maybe a riff on peanut butter noodles, with some thinly sliced bok choy and cucumbers tossed in? Or maybe I’ll use the tops of some mixed baby beets to do the sausage with swiss chard & rhubarb I printed out two weeks ago and still haven’t gotten around to (but did make last year, and loved). Mostly, I want to make sure not to waste this fleeting season when there is so much happening, but so much of it is so brief.